Looking for our tours in or around Changunarayan Temple? Kathmandu, Nepal is very well known for housing the historical places and is known as the “city of temples” as it encloses a number of temples. Changunarayan temple is one of the oldest temples in Nepal in Kathmandu valley. This two story temple is located on a huge hilltop known as Changu or Dolagir, in the Bhaktapur district, which is then surrounded by a village known as Changu village and a forest, comprising of champak tree. It was built near in 4th century. This temple was demolished through fire and was reconstructed in 1702 in pagoda style. 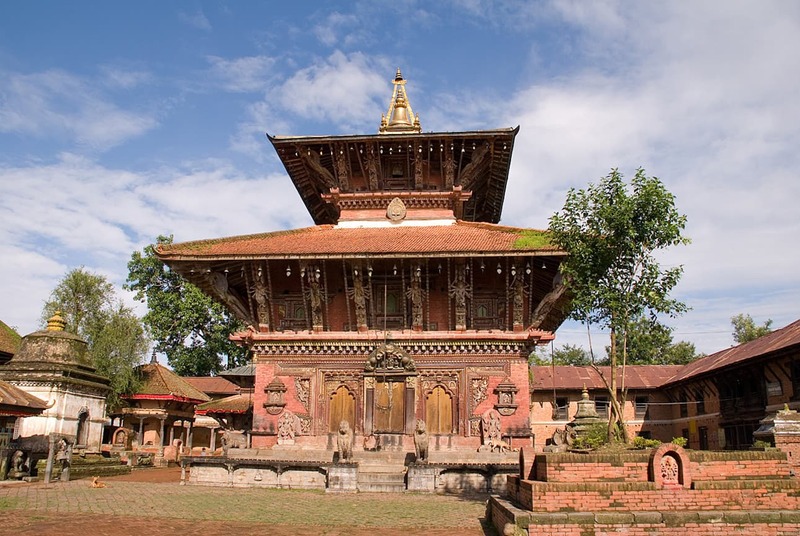 This beautiful temple is more embellished, bedecked, and furbished by some of the best specimen of stone, wood and metal crafts of the Licchavi period and this is the reason why it is called as the museum of carvings, of Nepal. This temple is dedicated and devoted to Hindu lord Shiva and lord Vishnu, who is thought to be the creator of the whole world. This temple is of great importance as it is the oldest temple located in the Kathmandu valley and number two; it is enclosing a huge statue or idol of Lord Vishnu with ten heads and ten arms, which was built in 5th century. After entering the temple you feel like if it is a house of statues as it is enclosing a lot of statues within it, especially of Lord Vishnu as Narayan which is also known as Narsinga, a must to watch, and as Vikrantha/Vamana, which is a six armed sculpture. Each statue has its own story. Garuda , built in 5th century, who kneels down with his hands folded, and is covered by red powder and tikka because of a special festival. This beautiful statue is resting in between a golden colored doorway in the Changu Narayan temple. There is another such kneeling statue of the king Bhupatindra Malla and his queen BhuwanLakshmi, resting in front of the temple. Statue of Trivikratha (Lord Vamana) was built in 8th century, which is a six armed statue. Next to this statue is the statue of Lord Narasimha. One of the statues, the Garuda is imaged on a Nepali ten rupee bank note. The oldest sculpture is sketched on a stone pillar, built in 464 AD apprises the story of a king of that time who stopped his mother from committing satti. Sculpture of Shri Maha Dev, Durga Avalokitesvara and Garud Ganesh can also be seen. Other statues include the statue of Vishwaroop built in 8th century A.D, Vishnu Riding Garud which was built in 10th century A.D.
Changu Narayan temple is also well known for the events and festivals that take place here. One of the main festivals that are conducted at the Changu Narayan temple is the famous Changunarayan Jatra. Another important festival is Mahashanan. Other festivals that are held at this temple are Jugadi Nawami and Haribodhini Ekadashi, on which special puja is carried out and Prasad is distributed, otherwise the distribution of Prasad is not a normal practice in this temple. Changunarayan temple is the best place to practice religious sentiments and religious duties. And the ever enchanting beauty of the temple, its surroundings and the statues coerces you to come back to this temple again and again.